There’s a new Bonefish Grill in our area and I was invited to check it out and to give you a chance to check it out as well. The new location is at Waterford Lakes: 12301 Lake Underhill Road Orlando, FL 32838, phone: (407) 275-2397. It was as though we’d told Al, our ever-friendly regular taxi driver, that we’d never eaten noodles or had never been to a grocery store before. He couldn’t believe that his food-loving customers had never been to his favorite restaurant. We laughed but didn’t think much about it. You see, when The Hubs and I go out for dinner, we try to avoid chains. It’s not a principle and we don’t have anything against chains or even the corporations that own them. Or at least, that’s not why we opt out. The reason is that chains seem to specialize in mediocrity. They’re very good at being not bad enough for you to complain but not good enough for you to rave. They cover up for the food quality and so-so service by having a large menu selection, large portions and lots of cheese slipping and sliding over the not-so-good-not-so-bad food. However, it seems that this does not apply to all chains. Specifically, Al was right: The Bonefish Grill really is awesome. 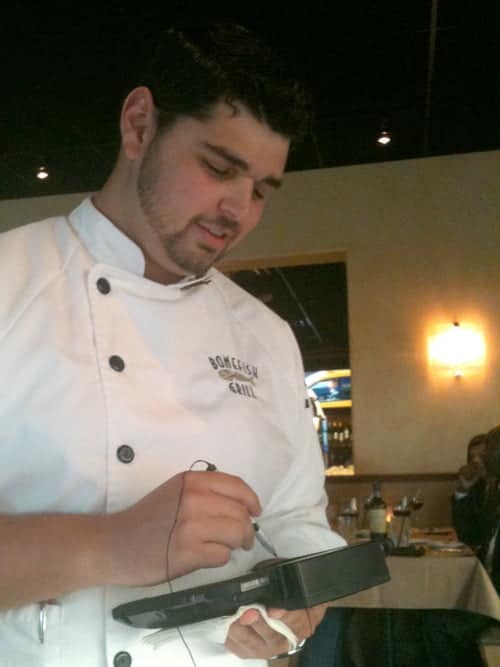 A few weeks ago I was invited to attend a dinner at a new Bonefish Grill location in Waterford Lakes, Orlando. We would be treated to anything we wanted from the menu if I was willing to write a Bonefish Grill review about the experience. Despite Al’s assurances, my chain-phobia made me worried that I wouldn’t have good things to say. It turns out that I have nothing bad to say. 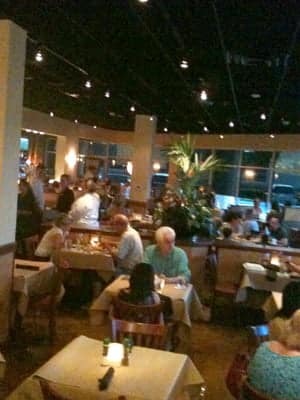 The Bonefish Grill at Waterford Lakes is a really fantastic restaurant. The restaurant itself was cozy but modern. The music was at a perfect volume where you could hear it but didn’t need to raise your voice to talk over it. I didn’t love that there was a big TV in the lounge that could be seen from the restaurant but neither of us was facing it during dinner so it wasn’t a big deal. The service was fantastic. It turned out that our server had been sent from another location to help train the staff at the new Waterford Lakes location. He was very knowledgeable not just about the food and the menu but also about the chain and about the process of opening a new location. We were amazed that the restaurant had only just opened and yet everything seemed to be running along perfectly. He explained that they had spent weeks in class teaching the new staff. After that there had been “Family and Friends” evenings where the staff invited people to come dine for free so that they could all get into the groove. Such an amazing process to learn about. He found an interesting bottle of craft beer. I went for the watermelon martini. It was flavored with both watermelon and cucumber, which I found refreshing on that humid Florida summer night. We then shared the Bang Bang Shrimp (of course!) and an order of the Ahi Tuna Sashimi. With my first taste of the Bang Bang Shrimp I was a bit disappointed. Not only had Al raved about it, but when I asked people on Facebook what I should order at Bonefish Grill the Bang Bang Shrimp response was overwhelming. So my expectations had been raised. So much so that I expected the shrimp to fly into my mouth themselves and bang around in there before taking me on a bite-sized adventure. They didn’t. Well, not at first anyways. Then we realized that we couldn’t stop eating them. And then we fought over the last one. 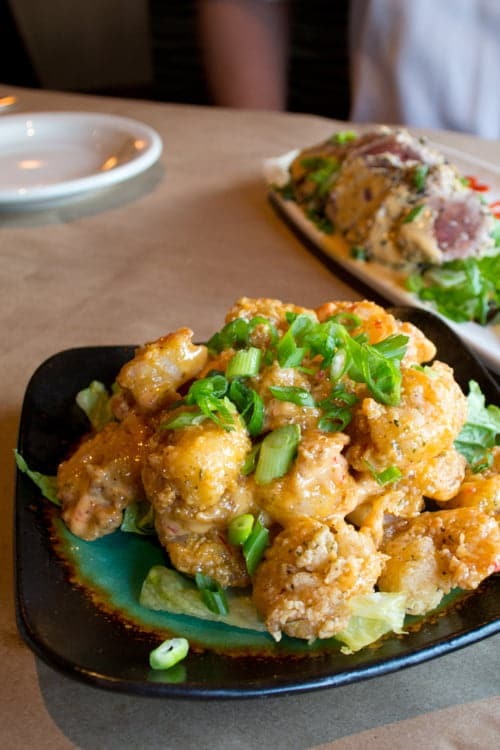 Bonefish Grill’s Bang Bang Shrimp creep up on you with an addictive spicy creamy sauce that you’ll never get out of your mind (I’m seriously drooling right now as I write this). The tuna sashimi was really good too. I like that it came with two different sauces (wasabi and what I think was sriracha) so you could mix and match the heat. The sesame seared crust was pretty on the fish as well. For our main courses I had the Chilean Sea Bass. The fish was cooked over the wood-burning grill and was moist and flavorful. I couldn’t decide which sauce I wanted to accompany my meal so I had both the Chimichurri and the Pan Asian sauce. They were both delicious, the Chimichurri robust with garlic and herbs, the Pan Asian a balance of sweet, salty and sour. If you’re intrigued by these sauces, you should check out the Bonefish Grill Menu online where they have links to their sauce recipes. I think I’m going to try making both of these at home. With my fish I had the garlic whipped potatoes and they were as creamy and garlicky as I’d hoped. It also came with the succotash. I found it a bit rich and greasy for a vegetable dish but it was still tasty. For his main my landlubber Hubs had the Fontina Chop. He was delighted with it (and I loved the tastes I had too). This was a really important aspect of our visit. Because The Hubs isn’t in love with seafood, he doesn’t usually want to go to restaurants that specialize in it. He’s had too many bad experiences where the non-fishy items on the menu are a just-in-case for the rare fish-hater who finds himself lost at one of their tables. In fact, he even says that you can judge the overall quality of a seafood restaurant by how good their non-fish dishes are. If the restaurant really cares, they will make sure that everything is delicious, not just their most popular items. I think he’s right. And the Bonefish Grill chop definitely got his meatatarian seal of approval. He had the Au Gratin Potatoes with his chop. They were as creamy as the whipped garlic potatoes but with a nice strong cheese flavor. At this point we were pretty stuffed. Not only had we had the drinks and the starters and our mains but also quite a bit of wine. But you see, Bonefish Grill was treating us to this meal and I felt that I couldn’t do a proper write up of the restaurant without at least tasting the desserts. So we used the bit of wine left in our glasses to wash down some tasty treats. I’m a sucker for Crème Brûlée and order it whenever I see it. The Crème Brûlée at Bonefish Grill had that perfect light-and-rich-at-the-same-time-but-I-don’t-know-how-or-why quality that I love about this dessert. The hubs had a rich and chocolatey concoction that he barely shared with me. I’ll just say that he was really quiet for awhile and so I know it was good. Our taxi driver smiled and asked questions the whole way home. We smiled and answered. It had been a good night. I hope you learned a lot from my Bonefish Grill review. It’s a great restaurant that has just won the Best Seafood in Orlando award from the Orlando Sentinel. I hope you check them out. Disclosure: The Bonefish Grill paid for my and my husband’s meal and gave us a $50 gift card for our own future use. I have not been compensated monetarily for this review. However, I recognize that I may have been given special treatment since they knew I would be writing this piece. I have done my best to be as honest and critical as possible and to not be biased by the meal and gift card they have given us. All opinions are my own. Evelyn, That salmon sounds incredible! Great choice. I would love to try and make the au gratin potatoes. I love potatoes. Thanks for the chance. Wow Nichole! You are a real Bonefish lover. I haven’t tried all the things you’ve listed but I’ve made note so that I can have them when I next go. I want to try the Warm Mango Salsa on some shrimp and scallops! I haven’t had the mango salsa. I bet it would be wonderful on seafood though, you’re right! I would love to make their longfin imperial. I love that restaurant! Awesome giveaway! There’s a dish (I should look it up, but my Internet is slower than molasses right now) that’s a pasta with shrimp and it’s spicy. I can see it on the menu. Anyway, I’ve tried recreating it, but it’s never the same. That dish sounds great. I think I saw it on the menu too. I wonder what they put in it to make it so delcious. I might have to order it just so I can try to figure it out! I have never been but I would love to try it out! Bonefish just opened last year near my house south of Pittsburgh PA. Ive only been there once but love the Bang Bang Shrimp, also! The location had only opened for a few weeks when we went and was quite loud but the service, food and drinks were all excellent. Geri, Too bad about the loud music. You should mention it to them. We found the music in a local frozen yogurt shop too loud. I sent them a private Facebook message and they responded with apologies. Since then the music has been at a much better volume. I hear you! I would love to have that recipe so I could make it at home whenever the craving hits. The saucy shrimp is my favorite dish from Bonefish! Ashley, I agree! It is soooooo good! I would love to try my hand at making the au gratin potatoes… one of my all time favorite sides! Rebecca, aren’t those potatoes spectacular. I enjoyed the garlic mashed potatoes I had when we were there but was totally jealous of my husband’s au gratin ones after I tasted them. The Lily’s Chicken would be an awesome dish to recreate at home. Or the salmon and asparagus salad is another favorite! Kristina, I haven’t tried either of those dishes. But I’ve heard about the chicken. I’m going to try it next time we go. Denise, I agree! I would live to have that recipe so that I could make it any time I get a craving for that creamy spicy sauce. Mallory, I totally keep hearing about the chicken. I am definitely going to try it next time I go. Julie, Let me know how you like it. We can compare notes at our next meet up. Bang Bang Shrimp for starters and then the Diablo Shrimp Fettuccine would be perfect to make at home! =) Glad you enjoyed the Bang Bang Shrimp…they are so addicting! Jennay, I haven’t tried the diablo. Adding it to my list of things to try. I would love to recreate the Florida Cobb Salad. Katie, I love a good cobb salad. I will definitely have to try theirs! I really like the dip that comes with their calamari, i would love the recipe for that to make at home! Shauna, I’ve actually been on the lookout for a great calamari dip recipe. I should try theirs and try to recreate it.